A sprayed seal is a thin layer of binder sprayed onto a pavement surface with a layer of aggregate incorporated and which is impervious to water. A Sprayed Seal is sometimes referred to as a "Spray Seal", a "Bitumen Seal" or a "Chip Seal". The are a number of types of sprayed seals, including primerseals, two coat seals, final seals & reseals. A sprayed seal is constructed by pouring aggregate over a layer of liquid bitumen. A hot mixture of bitumen and kerosene (binder) is sprayed on the road surface by a tanker to form a thin waterproof membrane. The bitumen is then covered with a thin layer of aggregate with tip trucks. 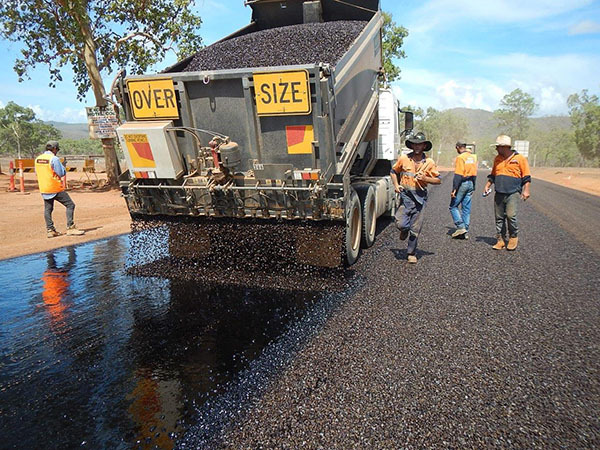 The aggregate is then embedded into the bitumen by rolling with a multi wheeled roller to form a skid resistant surface. The sealing aggregate is typically of blue metal (basalt) gravel with a nominal diameter of 7mm, 10mm or 14mm. Crumb rubber or polymer can be added to the bitumen to provide greater flexibility and strength. The life of a sprayed seal will depend on a number of environmental factors. Many Councils use an estimated useful life of somewhere between 8 and 25 years. The table below shows the useful life adopted by a number of Councils. Please feel free to add your Councils information.